A very charming Chinese export porcelain miniature ewer, decorated in under glaze blue with a lobed body meaning to resemble lotus petals, each panel painted with a ‘Long Eliza’ holding a blossom, alternating with panels of blossoming peonies, the spout, rim, and cover with later decorative silver mounts. Measuring 5 1/2″ tall, with a line to the body sealed and a small chip to the foot rim, otherwise good condition. Circa 1690.  A rare and unusual set of six Chinese export porcelain 8″ plates, decorated in the famille rose palette with vibrantly enameled courtly scenes, each plate depicting a different vignette as Mandarins in finely detailed robes move through scenes without any borders, the images rendered as paintings on porcelain without the usual confines of an encircling frame. What is as remarkable as the quality of the painting and unusual presentation is the fantastic condition of the pieces-six plates in very good condition with only a 1/2″ rim line on the reverse of one. Circa 1820. A very refined Chinese export porcelain Kangxi period molded lotus-form bowl, decorated in underglaze blue with a rim painted with images of ‘The Eight Immortals’, above a lower register of lotus petals, each rendered with alternating floral motifs, the interior rim with a stylized floral diapered border, the bottom with a central image of an Immortal seated upon a cloud. Other than a few very minor rim frits to the barbed rim, the piece is in excellent condition. Measuring 6″ in diameter and dating to circa 1690. An especially fine Chinese export porcelain teabowl and saucer of rare octagonal form, very finely painted in famille rose enamels with courtly Mandarin scenes and with a very richly detailed floral border against a gilded ground. Very good condition, great form and decoration. Circa 1820. A very beautiful pair of Kangi period Chinese export porcelain saucer dishes, decorated in underglaze blue and very finely rendered with a central landscape in the “Master of the Rocks” style, freely painted with great spontaneity, all within a “penciled” border of stylized lotus with a shaped rim. Finely painted and potted; one with two line sealed, and both with rim frits filled, otherwise good condition. Measuring 8″ in diameter and dating to circa 1690. A fine example of a Chinese export porcelain wash basin and guglet, decorated with Mandarin scenes in overglaze Famille Rose enamels, along with landscape vignettes and ‘bird-on branch’ motifs all within various underglaze blue foliate borders and with gilded highlights…a rather luxurious item indeed, with which to wash and shave! Some very slight enamel wear, otherwise excellent condition. The guglet 9 1/2″ tall, the bowl 10″ in diameter. Circa 1770-1780. This elegant Kangxi period Chinese export porcelain punch bowl is decorated in Famille Verte enamels with alternating panels of flowering branches of peony and prunus, the panels resembling lotus petals, the interior similarly decorated within a diapered border with floral reserves, and beautifully presented on its own finely carved hardwood stand . Measuring 12″ in diameter and with two lines sealed, otherwise very good condition. Circa 1700-1720. A very lovely Chinese export porcelain Kangxi period plate decorated in famille verte enamels with an elegantly balanced central design of lotus (the symbol of purity) issuing from the water, the rim with peonies and bamboo leaves on a stippled green ground alternating with floral sprig reserves. Measuring 8 1/2″ in diameter and in very good condition. Kangxi period, circa 1700-1720.